Operation Pram Push is now in full swing. 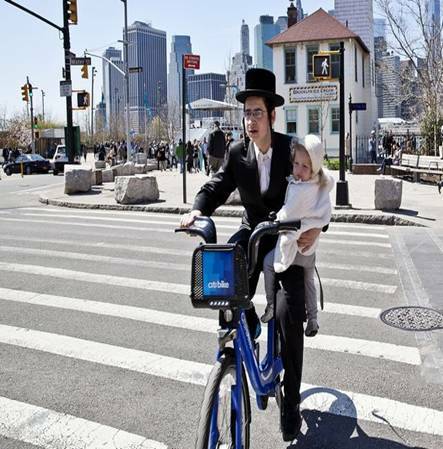 Dutch Anoek, who is a prominent pram-pushing member, has made a postcard of all the pram-pushing party. As mentioned in the previous Operation Pram Push update, Guust is of course Goose to us English lingo-speaking dwellers. 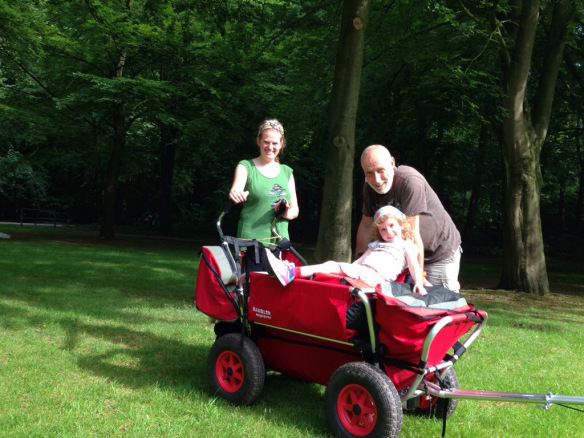 And here is the aforementioned Anoek and Goose in action with one of our glorified sledge-on-wheels that we will be pushing and pulling and heaving and hauling up and down Downs. (We're taking two of them). Like Anoek and Goose these sledges are very Dutch and are actually called Walking Wagons (see www.walkingwagon.com for more info if you're interested in carting large amounts of clobber - and children - about by de luxe wheelbarrow). 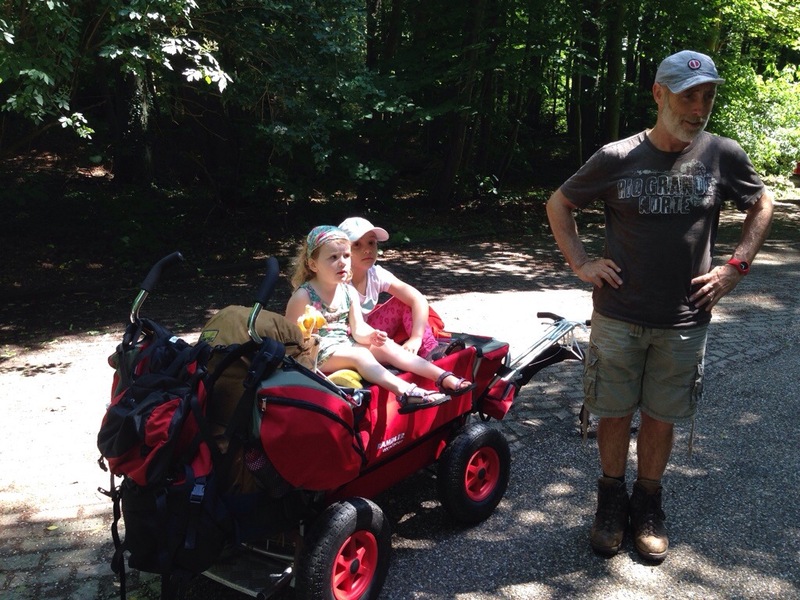 Our Rambler Explorer, as this model is known, is topped by the very lovely Mila (Anoek's daughter) who is sunning herself a treat. (Long may the sun last as I have a terrible habit of attracting the worst-weather-on-record everywhere I go). 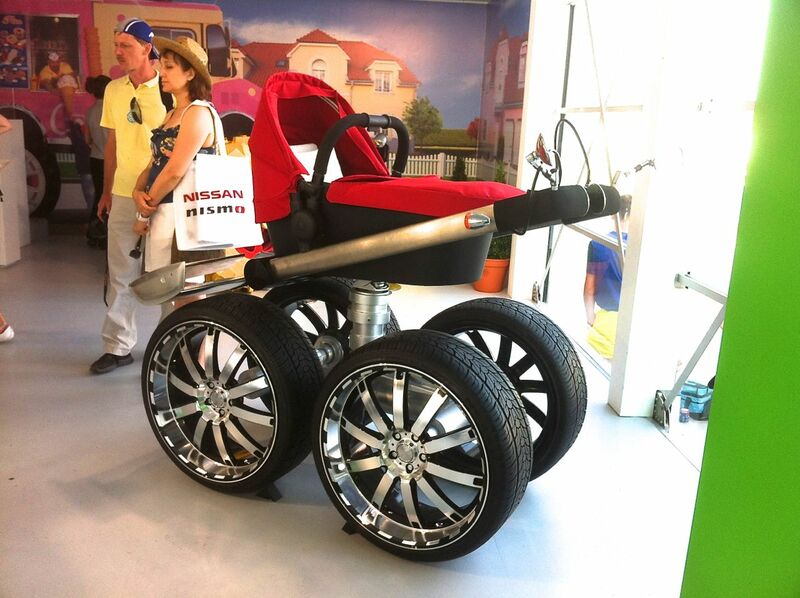 All I can say is who needs a Range-Rover-style pram like this when you can have a Dutch Rambler Explorer for transporting precious offspring? This is currently how I'm transporting my offspring of a precious nature (Jack) around in by bike-trike - cocooned amongst a thicket of fat foam. 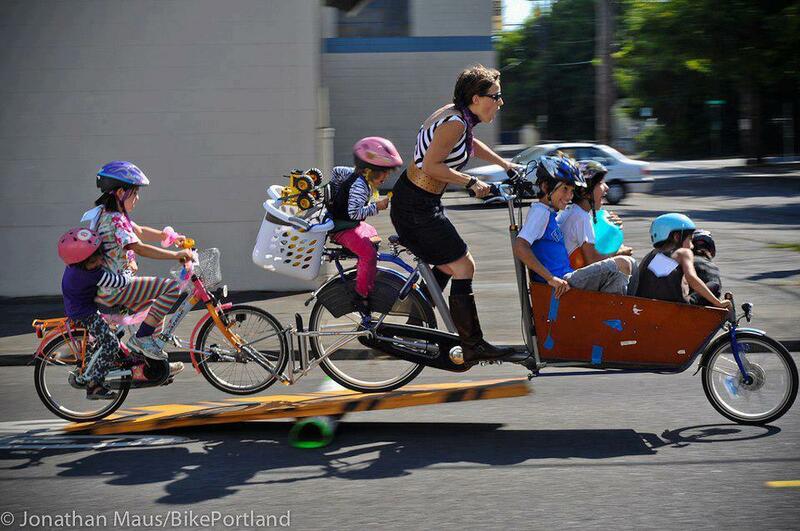 Other people have different methods for transporting their children about by 2 or more wheels as demonstrated by this mother in Portland, Oregon. Or there again, you may prefer the thigh-balancing-hope-I-don't-drop method of baby-on-bike-carrying as seen here in Brooklyn, New York. 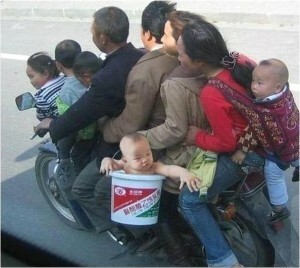 But I think the baby-in-a-bucket method (as seen here in Mubai, India) has to win hands down for sheer ingenuity on the economical and practical front. PS. 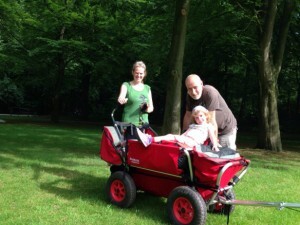 A very big thank you to Marcel and Gerjan at www.walkingwagon.com for sponsoring our jolly jaunt (at least we hope it’s going to be jolly – it will certainly be a little tricky) along the South Downs and for providing us with 2 of their fine Rambler Explorers). PPS. 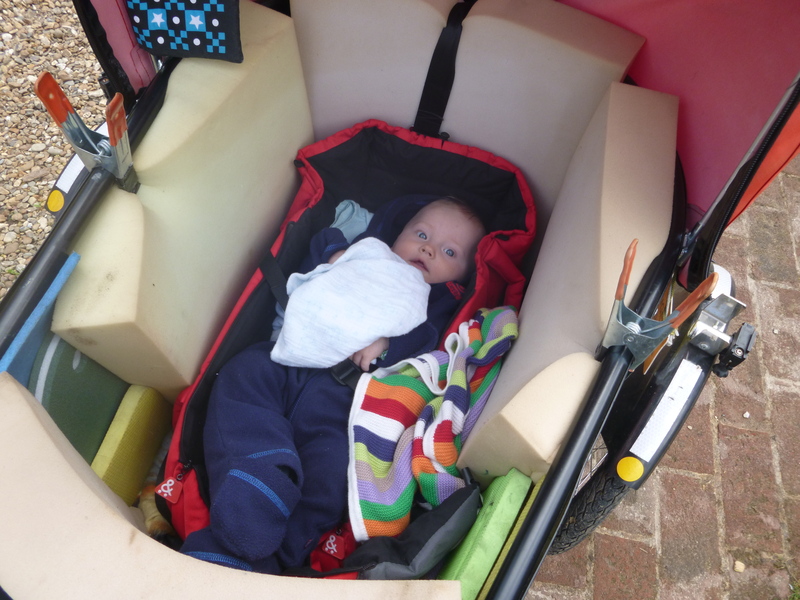 A big thank you also to Paula at Raindrops who has just kitted out Molly, Daisy and Jack with a fantastic array of wet-weather gear for Operation Pram Push. Raindrops is a local company I discovered in an industrial estate a half-an-hour bike ride up the road from me and they specialize in outdoor clothing from Scandinavia. Hopefully we won’t be having to sport any of Raindrops rainy wear as I like to think it will be sunny all the way, but best to be prepared in this pram-pushing walking-wagon game. PPS. Thanks to New York Steve for the last 3 pictures. Happy trails! You are a constant source of inspiration and entertainment!! Best of luck and sunny skies! Thank you Anni- am glad to be of entertainment value! Heaven knows what lies ahead. 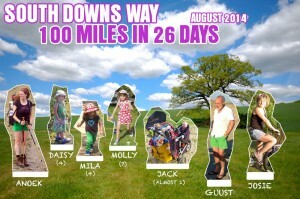 Sunny skies would be useful – a monsoon August fair disastrous for all small legs concerned. and their wives .Nuff said !